GAME OF THE WEEK: UCLA at USC, Saturday. Rivalry games are always intense. This one could have an intensity boost with both teams on the NCAA Tournament bubble. The Trojans (21-9, 12-5) appear to be in decent shape after winning their past four games, including a Utah-Colorado road sweep. The Bruins (19-10, 10-7) may still have some work to do after losing to Utah and Colorado. 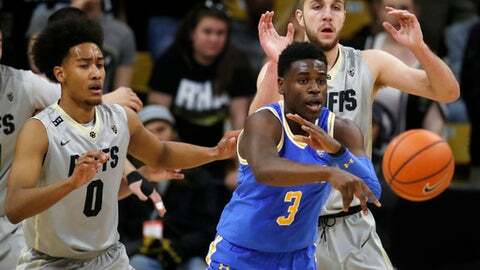 UCLA won the Southern California rivals’ first meeting on Feb. 3, edging the Trojans 82-79 after Aaron Holiday and Thomas Welsh combined for 44 points. USC also is playing for a coveted first-round bye in next week’s Pac-12 tournament and is a half-game behind Arizona for the conference lead. LOOKING AHEAD: Arizona has become a program in disarray. Coach Sean Miller has not coached the team or been to practice since an ESPN report said the FBI has him on a wiretap discussing a $100,000 payment to current freshman Deandre Ayton. Lorenzo Romar has filled in to lead the Wildcats and it’s unclear if Miller will return or be fired. Arizona star guard Allonzo Trier also has been eligible the past two games after testing positive for the same banned substance that cost him 19 games last season. The Wildcats still have the Pac-12 lead, but face an uncertain future. They play Stanford and Cal this week. INSIDE THE NUMBERS: Ayton is on pace to become the first freshman and sixth player overall to lead the Pac-12 in scoring and rebounding. He is tops with 19.9 points and 11.2 rebounds. … Washington State has made 313 3-pointers this season, becoming the seventh team in conference history to hit at least 300 3s in a season. … Arizona State’s Tra Holder is 11 free throws made and 15 attempts of entering the Pac-12’s top 10 in both categories. PLAYER TO WATCH: Reid Travis, Stanford. Ayton and UCLA’s Aaron Holiday appear to be the frontrunners for Pac-12 player of the year, but don’t count out Travis. The Cardinal forward is having a stellar junior season, averaging 19.3 points on 53 percent shooting and 7.9 rebounds per game. He scored a career-high 33 points and grabbed nine rebounds against Washington on his way to becoming the Pac-12 player of the week. ON THE WOMEN’S SIDE: No. 6 Oregon won its first Pac-12 title since 2000 by sweeping the Arizona schools alst week. That gave the Ducks the top seed and a first-round bye in this week’s conference tournament in Seattle. Oregon is the favorite to win the tournament, which starts Thursday, but the bracket will not be easy with No. 10 Oregon State, No. 9 UCLA, No. 16 Stanford and Arizona State in the way. Compiled by AP Basketball Writer John Marshall in Phoenix.